While you don’t have to avoid carbs completely, a low-carb eating plan can help you lower blood pressure and cholesterol while offering other health benefits. Trying to come up with low-carb dinner ideas can get tough after a while, but eating this way doesn’t have to get boring. We’ve put together three delicious low-carb dinner ideas that will tempt your taste buds while helping you achieve your health goals this year. This recipe takes everything you love about bruschetta and makes it low-carb. You’ll definitely want to make this more than once. Season the chicken with salt, garlic and Italian seasoning. Heat olive oil in a skillet or grill pan. 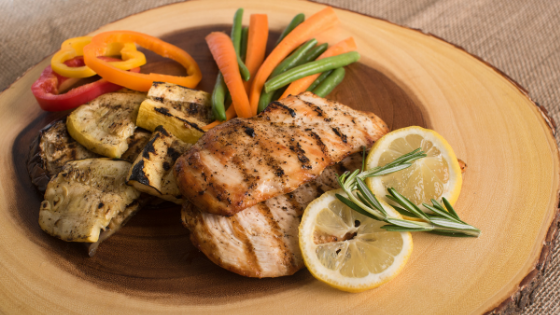 Sear chicken breasts on medium-high until they’re cooked through and browned on both sides. Remove and set aside to rest. Combine the red onion, olive oil, tomatoes and basil in a medium bowl. Season with some salt to taste. Top every piece of chicken with some of the tomato mix and then top with the Parmesan cheese. Drizzle with balsamic glaze and serve immediately. Salmon offers so many health benefits, and the addition of lemon, orange, and thyme make this low-carb dinner an absolute treat. Preheat your oven to 375 F. Line a baking sheet with parchment paper and then place the salmon on the paper. Drizzle salmon with the olive oil, seasoning with salt and pepper. Scatter the thyme sprigs, orange slices and lemon slices around the salmon. Roast for 20-25 minutes or until the salmon becomes opaque. Serve with lemon, thyme, and oranges on top. This meal is so easy to whip up in no time, and it’s fancy enough for guests. Eat it alone or serve it up with quinoa or brown rice if you’re eating healthy carbs. Preheat your oven to 400 F. Line a sheet pan with foil or parchment paper. Put sausage and cut veggies on the pan. Combine seasonings and olive oil in a small bowl, stirring until combined. Pour over veggies and sausage. Toss to coat. Roast for 15 minutes. Remove and toss again, cooking for another 10-20 minutes or until your veggies are fully cooked. Serve with Parmesan cheese. Whether you’re cooking for the family or having guests, any of these low-carb meals are a perfect choice, and they’ll keep you on track for your health goals. Having guests who are looking for apartments in Suwanee, GA? If so, have them call our office to learn what floor plans we currently have available.